Now that back-to-school season has fully set in, and fall has officially kicked off, it’s time to get organized at home. We like to think of this seasonal period as the perfect window of time to reset your spaces and take them from laid-back and breezy to prepped for the busiest months of the year. Whether that means readying your mudroom for cleats, straightening up your home office, or rethinking that spare room for guests, it’s all about making smart adjustments and getting things in order. Not sure where to start? We’ve rounded up three key spaces in the family home where reshuffling can help set a cozy and inviting tone for the rest of fall and beyond. The mudroom is easily one of the busiest spaces in any family home. Unlike the home’s front entrance, the mudroom is where the truth of daily life comes into full focus—it’s where bags and coats easily pile up, where floors meet dirty shoes and muddy boots, where practicality often trumps design and color. But your mudroom should be a space that feels inspiring when you leave each day and inviting when you come home, so a little stylish organization is utterly essential. First, Find A Place For Everything. Baskets or bins that can hold shoes, extra scarves, and bags make for versatile storage pieces that can be easily stowed away into cubbies and under benches. Consider also adding a row of wall hooks for extra jackets and coats and as a way to optimize storage space above the ground. Bench It. Built-in or otherwise, a bench can provide a perfect spot for putting on and taking off shoes, and one with hidden storage inside the seat can help keep clutter out of sight. Set a New Backdrop. Revamp your mudroom walls with a fresh coat of white paint or line it with an easy-to-apply wallpaper to take it from practical utility space to pretty passageway for the home. It’ll help make your mudroom feel less function focused on a daily basis. Prep the Floors. Lay down a runner to warm up the floors, which can also help track dirt dragged in from the outside. It will also add a nice touch of texture. Just like a new school year, fall is when work tends to pick up. Plus, now that so many of us are working from home, there’s no better time to get your home office/workspace in order. Whether you’ve carved out a small work corner or made room for a home office, a little rearranging and decluttering can help give your work routine a reboot. Stow It Out of Sight. Spend an afternoon going through any old paperwork that can either be tossed or tucked into a storage box. 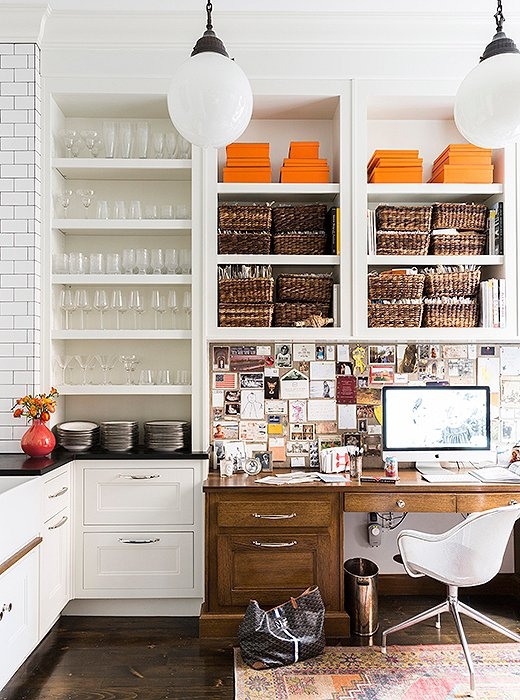 Stow them out of sight in upper and lower cabinets to help minimize visual clutter, which can often add to the daily frenzy of work. Wipe Your Desktop. Clear off your work surface to hold only what you need to get your job done. Reassess whether you’ll really use those stacks of notepads and multiple little holders filled with pencils that you ‘might need just in case’. Have Good Lighting. Good lighting makes all the difference when it comes to feeling inspired and productive in your home workspace, day or night. Make sure you have either a desk or table lamp and new bulbs for your overhead lights. If you’ve been meaning to redecorate a room in your home into a guest room, fall is the best time to tackle the project. It’s just before the holidays, so you’ll have a new room for the colder winter months. Transform that spare room you’ve been meaning to redecorate, or if your kids are finally off to college and their bedroom is up for grabs, update it into a guest room. Either way, it’s all about layering the room with warm and welcoming touches. Pull in Comfy Seating. A reading chair off to the side of a bedroom makes for a luxurious accent in any guest room. Or, add a bench or two ottomans to the foot of the bed to provide a little extra seating for your guests and give the room a sophisticated look. Stock Amenities. Ensure your guests feel pampered in the guest room by making certain that all the right amenities are in place—bedside reading lamps, a place to put down their luggage and coat, and plenty of storage off to the side. Cozy the Bed With Layers. Whether you’re looking to add a bed or you already have one, pile it with new shams and pillows and a cozy throw to give it a hotel treatment that warms up your guest room. Keep all the bedding neutral to instill a calm and soothing vibe. Looking to revamp a room in your home? Let Decorist help! Start a project today.